I was reading Kurt Vonnegut when I first tasted Vin Santo. On a sunlit June evening I sat alone at some trattoria lining the Piazza Grande in Arezzo, where I was studying that summer. With a chapter or two left of Slaughterhouse-Five, I figured I’d indulge in something sweet. I knew nothing about wine at the time, but after glancing at the menu I fancied “Vin Santo e Cantucci,” some sort of Tuscan blue-plate special, dessert plus an extra glass on the house. To my surprise, the waiter brought me no new stemware. Instead, he served a small bowl of wine encircled by biscotti-like almond cookies. The wine was less than spectacular – I recognized that even then – but the experience was profoundly gratifying, like an adult version of milk and Oreos. I watched the bowl of Vin Santo grow cloudy with each cookie I dipped. And when I ran out of cantucci, I slurped down the remaining Vin Santo with little wine-soaked crumbs revealing themselves in the final drops. As I read of Billy Pilgrim being thrust through time and space to the planet of Tralfamadore, with my bowl of Vin Santo I too sensed that I had entered another dimension—the old Italy we Americans romanticize so dearly. There’s a tradition in Tuscany of greeting guests with a “Vin Santino,” a small glass of the local dessert wine “Vin Santo,” when they arrive at your home. Tuscans call it the “benvenuto” or “welcome” wine, a pouring of which serves as an invitation into the famiglia. I returned to Tuscany this past October to accept that offer. Up until recently Vin Santo was a rather modest beverage, kept by its producers to share among their friends, rarely ever seeking a place on commercial shelves. Today, Tuscany opens its doors to the rest of the world to taste its treasured sweet wine. However, Vin Santo can be bewildering to both the modern winemaker and consumer. Paolo de Marchi of Isole e Olena admits production of Vin Santo remains in “the stone age of winemaking.” Indeed, documentation of the “passito” method in which Vin Santo is created can be traced back to 800 BC. In 2016, however, we live in an era where gyropalettes render the lightning-speed hands of Champagne’s riddlers obsolete, and mechanical lagares in Porto replace lines of human stompers, crushing grapes in rhythmic unison with their bare 'feet' through the night. Vin Santo undergoes no such processing. It’s a humbling experience to be in the presence of a wine that leaves its producer no option but to essentially let it make itself. A wine as ancient as Vin Santo of course comes with some debate as to the origins of its name. “Vin Santo” translates to “holy wine,” and historically the beverage has long been appropriated for sacramental purposes during the Catholic Mass. In fact, many of Tuscany’s greatest wineries for Vin Santo are housed in thousand year-old former monasteries. Another popularly held belief is the name “Vin Santo” derives from its Greek cousin “Vinsanto,” which may be a portmanteau of “vino Santorini.” The island produces a similarly styled sweet wine from the indigenous grape Assyrtiko. In many respects, the history of Vin Santo mirrors that of the Tuscan wine industry at large. For much of its existence, Vin Santo was a wine produced by sharecroppers. Tenant farmers could easily vinify small lots of Vin Santo above ground in the old homes that dot each estate’s landscape. It wasn’t until the Nineties that the Italian government recognized Vin Santo with its own appellations. Over a dozen DOCs for Vin Santo exist within Tuscany, but the most important are Vin Santo del Chianti, Vin Santo del Chianti Classico and Vin Santo di Montepulciano, established in 1997, 1995 and 1996, respectively. Two thousand six brought perhaps the most critical turning point for modern Vin Santo. 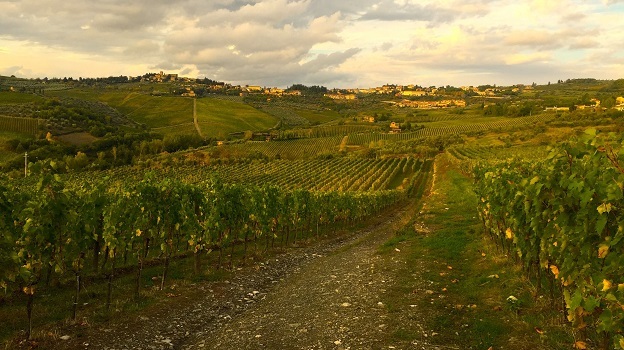 According to records provided by the Consorzio Vino Chianti Classico, the region’s proprietors declared nearly double the production of Vin Santo in 2006 from the previous year. Not coincidentally, 2006 was the first vintage in which white grapes were eliminated from the grapes authorized for the production of Chianti Classico. 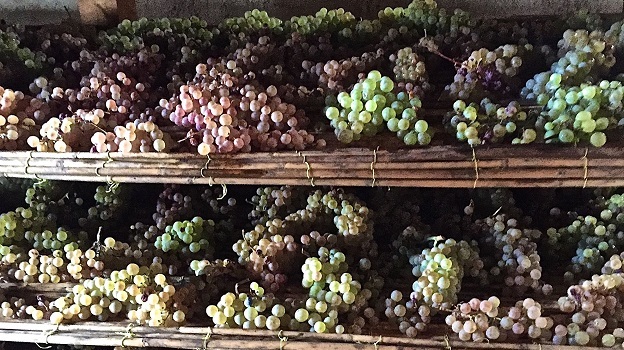 While some producers uprooted their vineyard plots of Trebbiano Toscano and Malvasia in favor of Sangiovese, others repurposed the white grapes for their Vin Santo programs. 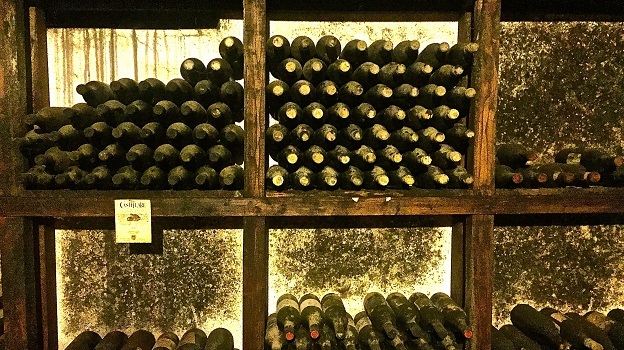 Ultimately, the change in legislation proved directly beneficial to Chianti Classico’s prized reds, as well as tangentially advantageous to its dessert wines. The broader question is if this Vin Santo explosion can find a market to support the increased production. I caught up with Brian Larky, founder of Dalla Terra, who imports both Badia a Coltibuono and Selvapiana’s Vin Santos to the United States (he also brings in Poliziano’s Vino Nobiles and hopes to add their Vin Santo to his portfolio in the future should quantities permit). He said frankly, “In terms of Vin Santo, it’s true that there’s a lot more fruit that’s available. It doesn’t matter how much supply you have. Has the demand for Vin Santo grown or changed? And the answer is no.” Larky, though, does move well over a thousand cases of Vin Santo half bottles each vintage. Other importers, however, may only be inclined to purchase Vin Santo at a discount from their clients, the wine flowing to distributors and retailers at this slashed rate. Larky also explains that a good portion goes to restaurants, where he believes by-the-glass programs are essential to selling the Vin Santo. Gianpaolo Paterlini does just that at Acquerello, the two-Michelin star restaurant, which, to my good fortune, stands less than three blocks from my San Francisco apartment. “We sell Vin Santo every night. It’s our best selling sweet wine for sure,” Paterlini tells me. He always has four to six Vin Santos open to offer by-the-glass, as well as over a dozen bottle selections available dating back to the Eighties. 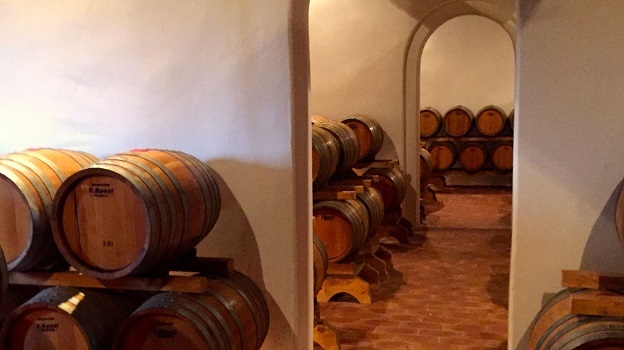 While Larky and Paterlini have both been able to find success with the wines, time will reveal whether or not Vin Santo’s growth as a category will be economically sustainable. Vin Santo can be a rather unruly wine. With the recipe unchanged for centuries, many winemakers have come to believe Vin Santo production “oenology free.” They’ll take on a laissez-faire mentality, sealing their barrels with wax, never checking up on their wines and hoping for the best once it comes time to bottle. Truthfully, they’re not all that far off—Vin Santo operates with a mind of its own. But, each winemaker is tasked with a series of decisions that will help guide the product into becoming a fine wine of the modern era. Not surprisingly, the first important question is what grapes to use. The most common choices are Trebbiano Toscano and Malvasia, both formerly included in the Chianti blend. Trebbiano Toscano, or simply Trebbiano (the same as France’s omnipresent Ugni Blanc, the chief grape behind Cognac and Armagnac), supplies acidity and helps focus the wine. Malvasia is better known for its contribution to Madeira, where it’s called Malmsey. Quite the opposite of Trebbiano, Malvasia sits broad and languid on the palate. The two grapes complement each other well, but most producers seem to favor one or the other. Many estates will also add a splash of Sangiovese into the mix, painting the resulting Vin Santo a shade darker in herbaceous, earthen flavor. A rare breed of Vin Santo called “Occhio di Pernice,” or “eye of the partridge,” derives from at least fifty-percent Sangiovese, depending on the appellation. Virginie Saverys of Avignonesi, one of the most acclaimed producers of the delicacy, said after much effort she could only find fourteen Tuscan estates bottling Occhio di Pernice. Beyond Trebbiano, Malvasia and Sangiovese, winemakers will experiment with everything from Garganega to Petit Manseng in their Vin Santo blends. Next, the winemaker must decide how and for how long to dry the grapes. 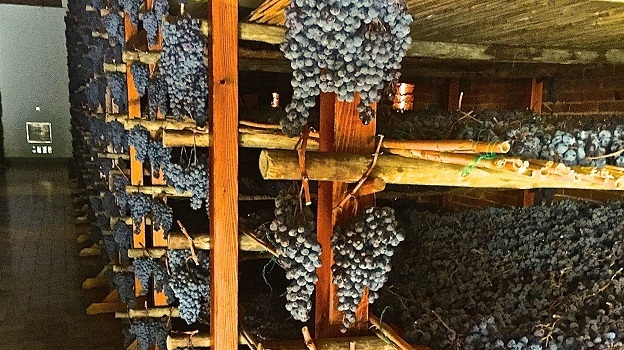 Upon harvest, clusters are brought to the “appassitoio,” an open-windowed attic room where the grapes are left to desiccate for the subsequent months. Each winemaker has his or her own preferred method of dehydration. Some will hang the grapes from chains, often thought superior as this allows three hundred sixty-degree exposure for each cluster to wind. Others find hanging too risky, as stems can easily break, especially as they dry out themselves, which may lead to many bunches falling on the floor. These winemakers typically opt to rest the grapes on plastic crates or bamboo shelves instead. With the passito process much determined by the whims of Mother Nature, certain winemakers will try to speed things up themselves. Many will place a fan in the appassitoio to mimic constant wind. Some will even dust the grapes with bentonite to absorb water and sulfite to repel mosquitoes. The sight is oddly magnificent, each grape cluster looking as if it were blanketed in snow. Regardless of how the winemaker dries the grapes, the most crucial decision is when to press them. Most will wait until around Christmas, but those winemakers seeking to maximize sugar concentration may hold off until late February or even early March. Lastly, the winemaker has to choose in what material to ferment and age the Vin Santo and for what length of time. Traditionally, Vin Santo lives in fifty liter barrels called “caratelli.” These small barrels are predominately made with chestnut wood, although also prevalent are acacia, cherry, juniper or caratelli constructed with planks of each. A good number of these barrels are many decades, if not over a century old. Winemakers today seem to show the most disdain for juniper caratelli, as they find the wood imparts an unpleasant astringency to the wine. In all cases, French and Slavonian oak appear to be the most popular replacements with today’s Vin Santo producers as the old caratelli begin to disintegrate. Fermentation and aging occur in the “vinsantaia,” another designated room on the second floor of one of these old buildings. For smaller Vin Santo programs, the vinsantaia and appassitoio are often one in the same. 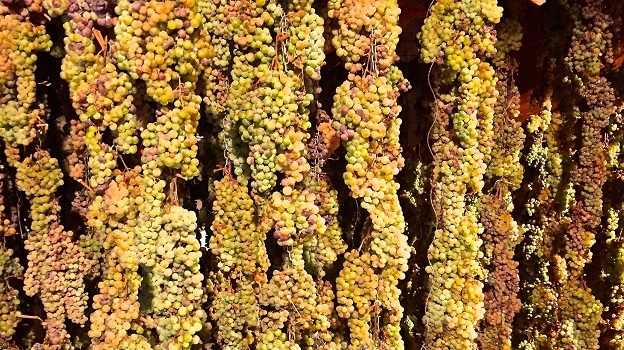 At the bottom of each caratello lies a sludgy mass of yeasts and a deposit of older Vin Santo called the “madre.” Many winemakers will claim that having a good madre is the key ingredient to making a successful Vin Santo. Depending on how efficient a yeast strain may be or how susceptible this “mother” culture is to arduous temperature fluctuations, Vin Santo can continue to ferment on-and-off for the next half-decade or longer. Fermentation primarily occurs in the spring and fall, with the extreme temperatures in summer and winter causing the madre to go temporarily dormant. Some winemakers will choose to cut the process short and remove the wine from caratelli beginning at the two-year mark (always leaving the madre for the next vintage). But, most fine estates far exceed the minimum two-year DOC aging requirement, electing an extended period in caratelli where the wine will gain concentration and viscosity. The problem is, however, that even after making these decisions, any given caratello can yield a Vin Santo tasting entirely different from its neighbor. The placement of each barrel in the vinsantaia comes to affect the resulting flavor of the wine, along with a cornucopia of other factors that make Vin Santo a mystery. As one might imagine, this randomness can be a source of frustration to winemakers. In turn, we have a vast range of profiles for Vin Santo. What’s more important than where the wine fits in that spectrum (and that can change any given year within a single producer), is that the winemaker begins with quality fruit and caratelli, a good vinsantaia and an excellent madre. While the ingredients may cook up something new each vintage, with the right chef in the kitchen, it will always be refined and complex. As the Vin Santo ferments and ages, much of the wine evaporates through the porous, old barrels. Winemakers expect to find their caratelli only two-thirds or half full once it comes time to bottle. As a result, the Vin Santo is essentially a fully-oxidized wine. Consumers may find this a blessing, giving them little reason to worry about a bottle of Vin Santo quickly spoiling after removing the cork – the wine is already very well acquainted with air. Yet, young, modern Vin Santos don’t taste particularly oxidative upon first release. Only after a decade or so in bottle will the wines most likely develop a saltier, Sherry-like profile. Similarly, volatile acidity is viewed less as a flaw and more an accepted fact. Truthfully, Vin Santo production in many respects more closely resembles that of balsamic vinegar than it does most other wines. In Modena, often considered home to the world’s most profound balsamicos, Trebbiano also plays a leading role in the blend, alongside Lambrusco rather than Malvasia. Over the course of several years, the cooked must passes through a series of successively smaller barrels, each made of a different wood and holding their own “madre” at the bottom. 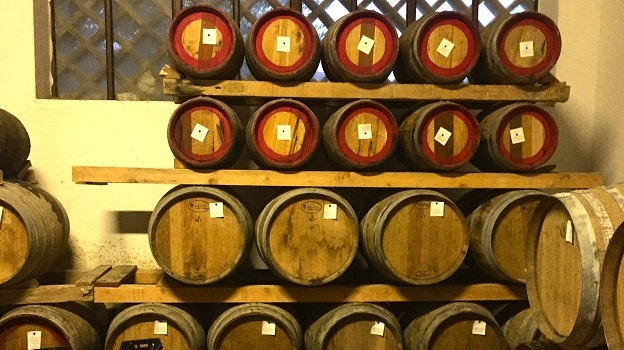 It’s not surprising that many Vin Santo producers favor the famed Modena cooperage Renzi Francesco for their caratelli (old Marsala barrels are also a popular choice). It is difficult to discuss vintage for a wine such as Vin Santo. Unlike most any other wine, a Vin Santo’s vintage doesn’t end with harvest. 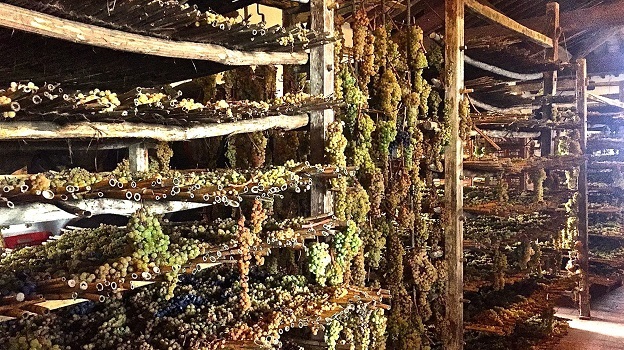 The weather continues to affect the grapes as they dry in the appassitoio for the next several months. With the vinsantaia always standing above ground, the ambient temperature dictates when fermentation will stop and restart and at what speeds over the course of the following two to sometimes ten or more years. Each and every subsequent vintage comes to affect a Vin Santo, as well as how long the wine endures this barrel-aging process, a decision falling at the discretion of individual winemakers. Similarly, subtleties of terroir become difficult to discern when so many other factors are at play. In terms of pairing Vin Santo, Paterlini advises his guests at Acquerello to steer clear of the cantucci. He finds, “It goes well with almost all our desserts,” due to the broad stylistic range of the category. One particular coupling Paterlini enjoys is Fèlsina’s Vin Santo with Acquerello’s bourbon-caramel semifreddo. Personally, I’m inclined to go for pungent cheeses—Gorgonzola or Parmigiano Reggiano, depending on the wine. I can also be equally satisfied with a glass alone. 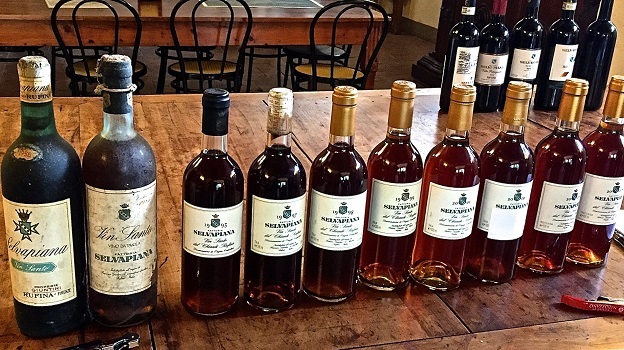 I visited fourteen esteemed producers of Vin Santo across Tuscany during my visit. Alas, I would never dunk cantucci in the Vin Santos of any of the estates mentioned below (at least while the vintner was looking). Antinori serves as testament that even the most-large scale Tuscan producers can’t industrialize the process of making Vin Santo. Stefano Carpaneto, director of winemaking at Antinori’s Tignanello, Solaia and Badia a Passignano estates, shared my excitement in tasting through five of their Vin Santos from the past decade, a vertical he says he rarely pours. There was a fascinating disjunction between the wines at hand and the setting that morning, a private glass room that floats above aging barrels of Chianti Classico in Antinori’s magnificent new facility designed by renowned architect Marco Casamonti. When I was subsequently shown the vinsantaia, it became evident that Antinori’s production of Vin Santo is as unmodernised as anybody’s. Beginning in the vineyard, the grapes – approximately five parts Trebbiano and one part Malvasia – are harvested manually in early to mid-September. They rely on wind rather than fans in their appassitoio, where the grapes dry on bamboo mats until around Christmas. Antinori leans closer to the minimum two-year aging requirement than many other producers, leaving their Vin Santo in caratelli for three years. Utilizing primarily French and some Hungarian oak, Antinori still makes use of a number of peach, cherry, chestnut and acacia caratelli of varying sizes. Interestingly, Stefano does rack his Vin Santos for the purpose of obtaining a clear color – an uncommon practice for the appellation. Ultimately, Antinori produces a modest amount of approximately 10,000 bottles of Vin Santo each vintage, which they have no difficulty selling. Antinori’s current vintage, 2010, was among the youngest Vin Santos I tasted during my trip. It was expectedly lighter in body, yet still a wholly complete wine. The 2010 tastes notably clean, refreshing even – an adjective I seldom jotted down in researching this article. It has a shimmering candied citrus quality, complemented by notes of peach and caramel. The 2008, coming from a dry, warm vintage, is noticeably more oxidative – you can tell by the color alone. Possessing an entirely different profile, this Vin Santo has a distinct cereal-grain quality, accented by toffee and dried sage. The 2004 dramatizes this herbaceous character further, but maintains a beautifully lifted texture, never losing the youthful gossamer quality found in the 2010. By 2003, you begin to notice the earthier flavors emerging – porcini, potting soil, coffee bean. The wine lies broad on the palate, leaving a pleasant umami tone upon finishing. Interestingly, the 2000 reverts back to a more lithe, citrusy composition, bearing an elegant mélange of bergamot orange and fresh apricot. The flight proved to me that this younger style of Vin Santo can work well too, containing the ability to age both gracefully and mysteriously in bottle, just as the more voluptuous styles of Vin Santo do. I began my Vin Santo tour this October in Montepulciano with a stop at the mother ship: Avignonesi. No other Tuscan estate has come to emblemize modern Vin Santo’s entry into the realm of fine wine quite like this property. Almost every other producer I visited mentioned Avignonesi’s Vin Santos as the point of comparison to their own. I figured it best to begin my study of this wine at the benchmark winery. In retrospect, I fear this was not the wisest decision. This is not to say that Avignonesi is unworthy of the copious accolades it earns each vintage – the extraordinary complexity of these wines is irrefutable. But Avignonesi’s Vin Santos provide such a singular experience, I find it almost difficult to discuss them within the context of these other wines. Historically, Avignonesi has exaggerated most every necessary step in the making of their Vin Santo. Beginning with the 1996 vintage, Avignonesi produced a string of lauded Vin Santos through a process designed to maximize the wine’s opulence. 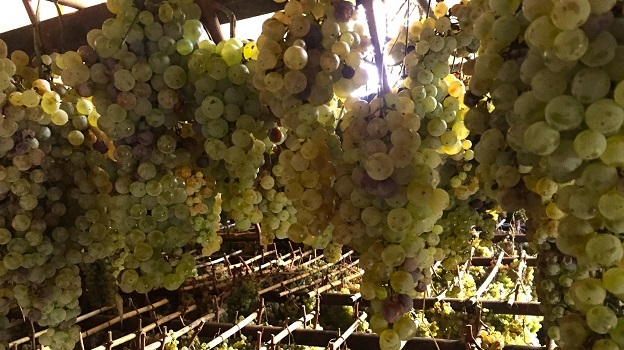 The grapes, Malvasia and Trebbiano for the traditional Vin Santo and Sangiovese for the Occhio di Pernice, were left to dry in the appassitoio for six months. Around March, the grapes are manually crushed in a process that takes two weeks due to the density of the shriveled fruit. The wine then rests in one hundred year-old Slavonian oak caratelli for a period of ten to twelve years. 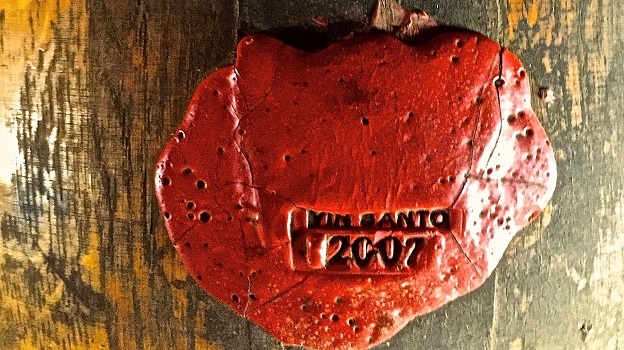 Once each year, the winemakers will break the wax seal of a single caratello to monitor the Vin Santo’s progress. But after a series of vertical tastings of Avignonesi’s Vin Santos, Belgian proprietor Virginie Saverys, who fully acquired the estate in 2009, actually prefers the style of Vin Santo offered before the estate’s famous wines from the late ‘90s. With this in mind, Avignonesi now crushes their grapes at the absolute earliest date allotted by DOC regulations—December 1 for the Vin Santo and January 1 for the Occhio di Pernice. If it were up to Saverys, she’d press even sooner. It will be nearly a decade before we will see any of Saverys’ Vin Santos on the shelf. I’ll be curious to see if the Avignonesi’s signature sumptuousness stays intact thanks to the extended barrel aging, or if the earlier pressing truly will enact a dramatic stylistic-shift toward the more delicate wines that suit her palate. At Avignonesi, I was given the privilege of tasting four vintages of both the Vin Santo and the Occhio di Pernice. These wines are as bold and liqueur-like as the category gets. Avignonesi actually goes as far as to serve their Vin Santos in Cognac glasses, the only producer I visited to do so. (In truth, it was probably the most convincing glassware decision I experienced this trip, having tasted Vin Santo in everything from Bordeaux stems to Champagne flutes.) Upon finishing both flights, what struck me most was a beguiling Benjamin Button-like quality to these wines’ lifespans. These Vin Santos seem to age backwards, the oldest wines tasting the most sprightly. Later that afternoon, I noticed a similar pattern at Poliziano, also in Montepulciano. But for Avignonesi, this effect may potentially be a product of the aforementioned changing of the guard in the mid-Nineties. In each flight, the first two wines came from the celebrated, opulent vintages and the last two from the more elegant years Saverys likes. Considering how vibrant these nearly thirty year-old Vin Santos taste, Saverys may very well be onto something. Beginning with the “regular” Vin Santo, the current release, 2001, already tastes like a fully mature wine. Every note sings in perfect harmony. The Vin Santo immediately demonstrates that a wine with this much sugar need not to be saccharine. Sure, the 2001 is astoundingly viscous, but like a really good honey, it possesses an earthiness that makes you want to eat it by the spoonful. A damp mushroom character percolates through the 2001, followed by a fresh cashew nuttiness distinct from the saltier versions observed in many of the older Vin Santos I tried. The 1996, the first of the vintages in this style, treks a similar trail. Somehow, it’s even denser than the 2001. I love this compactness of flavor, but the wine smells hotter, despite the alcohol level being essentially identical to the current release. While this makes it difficult to smell the wine, on the palate this creates a burnished effect that enhances its savory edge. The 1990 Vin Santo takes a 180-degree turn. Bright and spry, it tastes sun-kissed rather than slightly sunburnt like the 1996. With notes of fresh caramel sauce and candied orange peel, the wine’s acidic drive gains vitality in comparison to the younger wines. The 1987 leaps even further in this direction, having lost a few inches off its waistline. Lower in body and higher in floral, citrus character, the 1987 shows a lift I more commonly found in other producers’ youngest wines, even while simultaneously sharing a smidge of more aged, nutty notes. The flight of Occhio di Pernice divides itself similarly in half. Very lightly filtered, the cloudy 2001 Occhio di Pernice shows smokier than its white counterpart. The wine embraces more masculine notes of humidor and restorative herbs. There’s something about the Sangiovese that makes this wine sensationally medieval, as if some travelling apothecary drew a vial of this elixir from his pouch and handed it to you. The 1997 is the most virile wine of the lot, tasting of tobacco leaves, cigar ash and burnt caramel. It’s persistent and dense, finding every corner of your mouth and seeming to just stay there. The flavors are so clearly defined, but there’s nothing gentle in this incendiary Occhio di Pernice. There is delicacy, however, to the 1993. A vein of bergamot orange peel acidity illuminates the rest of the ashen wine, like a stream of bright lava flowing down a volcano’s black, scorched slopes. The citrus helps provide clarity for the more savory notes, making the wine seem less heavy-handed than in successive vintages. The acidity integrates even further into the 1990, creating a silky, seamless and more effeminate Occhio di Pernice. What a peculiar path these Vin Santos take at Avignonesi. Badia a Coltibuono’s Vin Santo comes from vineyards active since approximately 1050 AD, when the old monastery that houses the winery was built. But, despite the estate’s monastic history, Badia a Coltibuono breaks a couple traditions in its production of Vin Santo. Beyond Trebbiano and Malvasia, proprietor and winemaker Roberto Stucchi Prinetti includes some Colombana and Garganega in the blend. The latter, interestingly, is responsible for the Veneto passito-style wine, Recioto di Soave. Stucchi also initially places his Vin Santo in small tanks, leaving them there until he is certain fermentation has commenced. He believes this tactic results in more consistency of flavor between lots. Subsequently, the Vin Santo is moved to caratelli, where it remains for six years. Badia a Coltibuono releases two Vin Santos—one white, the other Occhio di Pernice. The 2008, currently on the market, comes to life with a medley of freshly dried fruit flavors—pineapple, apricot and lemon peel. A buttery coating crescendos through the mid-palate, but ultimately a train of bright acidity finishes past any fat. For this vintage, Stucchi moved the vinsantaia to a warmer area, which he associates with the fruitier notes found in this wine. The 2006 is lighter in body, but darker in flavor. It expresses a distinctive herbaceousness, tasting of dried rosemary and the sun-drenched chaparral of the Tuscan hillsides. It doesn’t have the love handles of the 2008, but still shows a toffee, caramel flavor. The 2005 offers a similar profile, with an appealing crushed-stone minerality. I quite enjoy the trajectory of this vintage; rather than coming to a clean point, the wine’s flavors grow to a broad, lambent finish. Their Occhio di Pernice is a different animal entirely, even more distinct from Coltibuono’s white rendition than Avignonesi’s two Vin Santos are from one another. Stucchi relies on “perfect” Sangiovese clusters for the Occhio di Pernice, loose and healthy. He crushes the fruit in a basket press, but leaves the must there for two days for the skins to impart more pigment. The 2006 sweeps across the palate in broad strokes of coffee grounds, poached figs, toffee and buttered popcorn. A thread of acidity keeps the Vin Santo focused and long, needling its way through the fleshy, brooding wine. The 2004 colors itself a shade darker, veiled by a beautiful burnished character. The wine reads as earthier than the 2004, the dark chocolate and coffee notes here translating more as potting soil or a wounded forest floor healing after a fire. This shapes a fascinating juxtaposition for a candied orange peel acidity that shoots through the mid-palate. Ironically, these tainted flavors allow for a greater purity of fruit that emerges through its depths. Castellare’s Vin Santo sits in the middle of the road between the old style, Sherry-like Vin Santos and today’s sweeter, more voluptuous renditions. The wine spends at least four years in barrel, which age directly beneath the chains of grapes hanging from the ceiling of Castellare’s remarkably space-efficient vinsantaia. Their blend remains approximately sixty-percent Malvasia and forty-percent Trebbiano. The current release, 2009, demonstrates extraordinary freshness, with a line of candied citrus racing through the wine. Notes of apricot, blood orange, and lemon cream fuse with a distinctive porcini character, unusual in such a young wine. Incidentally porcini mushrooms do grow on the estate, and fortunately for me were in season during my visit. That mushroomy quality pervades the rest of the flight. The 2005 yields an energizing salinity, which in the 1998 translates as wet minerals. The 1998 begins to reveal signs of age, taking on a buttered nut flavor, but still retains a bright youthfulness. Winemaker Alessandro Cellai notes that, at least for red wines, 2009 and 1998 were analogous vintages. So perhaps their current release of Vin Santo is heading in the direction of the oldest wine we tasted. At seventy percent Trebbiano, the remainder Malvasia, Castello della Paneretta makes a Vin Santo more elegant than opulent. The wine spends five years in a mixture of oak and chestnut caratelli, sealed in wax. Their 2007, presently on the market, is medium-bodied for its category, yet its flavors carry a bolder weight. The Vin Santo embraces a beautiful burnished quality with flavors such as toasted marshmallow and light roast coffee. It’s a very long wine, finishing with a welcome splash of butterscotch. Like Antinori, Castello di Gabbiano is a large production winery with a small, handcrafted Vin Santo program. While their primary winemaking facility stands expansive and technologically equipped in the hills beneath the castle, the vinsantaia rests in one of the many unassuming structures scattered across their landscape. The Vin Santo ages for four years in a handful of caratelli laid on the floor, as grapes come in each vintage to dry in the loft above. Their current release, 2010, radiates with a lovely honeysuckle aroma. Satisfying without being stodgy, this Vin Santo values freshness over opulence. It has a pure, electric citrus core that races through the wine, leaving the palate with a clean finish. Fèlsina lies on the southernmost end of Chianti Classico, its vineyards rolling into the gentle hills of Chianti Colli Senesi across the border. Proprietor Giovanni Poggiali aims to produce a Vin Santo that sits at the middle ground between the old and new styles. He’s also working on creating a reserve bottling. Fèlsina repurposed the top floors of a series of thousand year-old farmhouses sprinkled across their celebrated Rancia vineyard as appassitoio. There the grapes dry on bamboo shelves until crush around late December or early January each year. Afterward, the wine is aged for seven years in one hundred liter casks, made from a mixture of Hungarian and French oak and F. Renzi caratelli, before spending an additional year in bottle before release. Poggiali checks about fifty percent of barrels at the one and five year marks. Malvasia drives the blend of Fèlsina’s Vin Santo at about forty percent, the rest evenly divided between Sangiovese and Trebbiano. Despite the relatively high dose of Sangiovese, this Vin Santo falls just slightly on the lighter side. Perhaps the most refreshing Vin Santo I tasted, the current release 2005 blooms with bright citrus flavor – freshly-squeezed lemonade and orange blossom. It has a high acidic lift that carries the wine to a long finish. Giovanni Poggiali also prefers his Vin Santos served slightly chilled, a smart move that accentuates the youthfulness of his wines. The 2004 tastes like an entirely different Vin Santo. It takes on a more herbaceous profile, with a bitter edge of toffee and coffee grounds. While the flavors are darker, the wine doesn’t feel any more viscous than the 2005. Trying the 2000, we arrive at something wholly new again. At a high seventeen-percent alcohol and a low 89.1 grams of residual sugar, this Vin Santo is rather individualistic. Grounded in the typical salted nuts profile, the wine is speckled with an ashen, fire pit quality. This vintage was aged in one hundred percent in new barrels, most likely causing this burnt effect. The 1995 shows the flavor of whipped honey and fresh caramel, but without the viscosity. Still tasting young, it has yet to gain those earthier aromas. The morning after I visited Giovanni Manetti of Fontodi, the next vintner on my itinerary described Fontodi’s Vin Santo as one “made to shock you” (in comparison to his own, of course, which he believed adhered more to a traditional palate). In a certain respect, today Fontodi does produce a Vin Santo in a more modern style, at least in terms of taste. Without question, Fontodi’s Vin Santo scores high on the hedonist scale. Giovanni Manetti’s innovation comes primarily in the blend of his Vin Santo– essentially a fifty-fifty split between Sangiovese and Malvasia. He uses a small amount of Trebbiano, as well as Canaiolo, Sangiovese’s chief blending partner in Chianti. Nevertheless the actual production method remains basically technology-free. Manetti uses an array of different size caratelli made from a variety of different materials including chestnut, mixed wood, and one old Marsala barrel. He’s slowly introducing more French oak into the equation. After sealing with wax, the caratelli remain unopened for seven to nine years. The resulting wine is massive, broad and dense. The current release, 2005, beats a slow but solid pulse of flavor. Full-bodied and satisfyingly sticky, the wine seduces you with the taste of café au lait, milk chocolate, toffee and dried figs. A wave of acidity carries notes of bergamot orange and ripe apricot to the finish line. In the 2004, the date and prune flavors race closer to the forefront. Retaining the same weight, this is a much more savory Vin Santo, washed with the taste of balsamic-soaked herbs and forest floor. The 2003 loses a bit of body, but gains a degree of freshness. Whereas the coffee flavors are less active here, the plummy character takes on a more entrancing role. The vintages 2001 and prior mark a shift back to Fontodi’s former more traditional style. The wines were blended with less Sangiovese, and the Vin Santos were lighter in body and color as a result. Manetti has also since relocated the vinsantaia. The room used during this earlier period enabled a more aggressive fermentation leading to wines with higher alcohol levels. The 2001 exhibits a nutty, saline quality – tasting of salted cashews. The fruit here – still primarily apricot and orange – feels more dried than in subsequent years. The 1995 errs even closer to that delicate, fino Sherry feeling – making a better apéritif than dessert. Arriving at the 1993, Manetti says this “tastes like the old Vin Santo.” The wine has what I’d call “good funkiness,” with the flavor of dried charcuterie and pungent mushrooms. Its fruit actually takes on a more tropical profile – dried mango and pineapple. The 1999 stands out as the black sheep of these older wines. It’s almost prophetic, resembling more the juicy, voluptuous Vin Santos being made at Fontodi today. With notes of butterscotch and popcorn, along with a vibrant acidity, the 1999 is a knockout beauty that is aging gracefully. Vintner Paolo de Marchi claims one of the smartest decisions he made was moving his two vinsantaie to the ground floor in 1991. 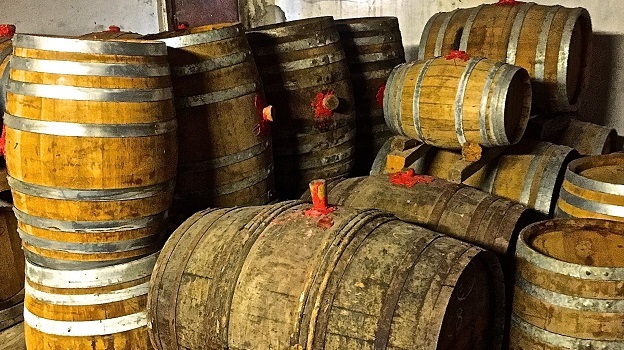 Although it forgoes tradition, he believes having the barrels closer to the cool ground helps preserve acidity and prevent a “cooked” taste to the wine. While I can’t say whether or not the relocation is the cause, the first thing I noticed when trying Isole e Olena’s Vin Santo was a kinetic vibrancy. It tastes as if every particle in the 2006, its current release, is in acceleration and en route to collision. Flavors of orange blossom, dried apricot and freshly squeezed lemon crescendo through the finish. That bullet of citrus lingers longest, piercing through a more savory mid-palate of buttered popcorn and toffee. Despite the solid lift the acidity gives, the wine is full bodied, thanks to the two-thirds Malvasia. That breadth really comes across in the 2005, which embraces a more almond paste quality. As the Vin Santo ages, the acidic flavors fold into the other aspects of the wine, revealing a beautiful cold mineral character in the 1999. After a couple decades, the 1993 has shed some of its baby fat without losing its more confectionery attributes—cream of caramel, fresh vanilla ice cream and apple crisp. Still, oxidation makes way for nuttier flavors and a pleasant sesame quality. Poliziano, another celebrated Montepulciano estate, seems to echo nearby Avignonesi in the style of their Vin Santo, including its mesmerizing reverse-aging effect. The grapes are harvested in September, but left to dry until February, at which time they are pressed manually. Winemaker Federico Carletti then ages his Vin Santo for a minimum of seven years, but often longer, in French oak caratelli as well as chestnut, which he is phasing out. Poliziano has released Vin Santo since the 1995 vintage, but Federico does not choose to produce the wine each year. Instead, he on relies on exceptional vintages that yield Malvasia that has the pedigree and quality to undergo the passito process. Federico is presently experimenting with creating a new madre, built from yeast strains cultivated from 2006’s spontaneous fermentation. The long drying time and many years in barrel result in a broad, Rubenesque Vin Santo, amplified further by a bold blend of ninety to ninety-five percent Malvasia (the rest is Grechetto). The 2006, Poliziano’s current release, is drippingly viscous, punctured by a brawny, Mandarin orange acidity. The wine finishes long with this citrus drive, but peppered with more savory notes of burnt caramel, mocha and tarragon. The 1999 ends on a similar acidic note, but coats itself in a bit more fat, tasting of maple syrup and melted toffee. Alas, the 1997 feels the youngest of all. It manages to shed its layers, to reveal a breathtaking purity of fruit – Red Delicious apple, pear and tangerine – and a fresh minerality. Despite being nearly two-decades old, the 1997 evades the more oxidative notes you’d come to expect in a Vin Santo of this age. Of all the estates I visited, Rocca di Montegrossi employs the most meticulous oenological practices in their production of Vin Santo. Owner Marco Ricasoli-Firidolfi demonstrated for me their innovative drying system in the appassitoio. The grapes hang from large vertical metal grids suspended from the ceiling. The grids can be moved back and forth to create aisles between them. This allows for cellar hands to routinely search for rotten, non-botrytized grapes. Marco will not crush until all the grapes remaining are affected by noble rot, usually late January or early February. After crush, instead of heading to the caratelli, the must first takes a pit stop to the stainless steel tanks, where it is cleared of any sediment. Finally, the wine is taken to multi-wood caratelli, made of oak, cherry and mulberry, where it will ferment and age for six years. Interestingly, Rocca di Montegrossi does not repurpose their madre each vintage, instead relying on spontaneous fermentation. Another peculiarity, Canaiolo contributes five percent of the blend, the rest being Malvasia. The red grape Canaiolo historically serves as Sangiovese’s partner-in-crime for Chianti Classico, but doesn’t find its way into Vin Santo all too often. All the scrupulous work does pay off, as Rocca di Montegrossi’s Vin Santo tastes absolutely stunning. That’s not to say, however, that these methods standardize the resulting character of these wines, freeing them of the entropic mysteries that occur in caratello. The three vintages we tasted all bore distinctive flavor profiles and structural differences, with residual sugar and alcohol levels all over the map. Their current release, 2006, was my personal favorite of the lot. It walks this beautiful tightrope, balancing an earthly savoriness with confectionery decadence. Indulgent flavors of bananas foster, crème brûlée crust, grilled figs and orange jellies wax through the mid-palate, corrupted by the taste of light roast coffee and sage. The 2004 is driven by an appealing ashen quality. It wears a smoky, primitive coat of firewood, toffee and espresso grounds. But, like a golden phoenix, dazzling flavors of orange peel and pomegranate compote emerge through the wines core. The 2004 tastes a shade hotter than the 2006, and the alcohol becomes more apparent still in the 1997. Oxidative notes start to color the 1997 after nearly two decades of life, and it begins to lose a hair of its viscosity in comparison to its more corpulent younger siblings. Still, it holds onto considerable fat for its age. Saline notes of salted walnuts and chocolate-covered pretzels compete with a fresh wintery spiciness – rosemary, frankincense, pine needles and gingerbread. The flavors spiral into a languorous and deeply gratifying finish, a characteristic of all these wines. Since we’re getting technical, I can’t lawfully call San Giusto a Rentenanno’s dessert wine Vin Santo. Their cleverly named “Vin San Giusto” has long been labeled Vino da Tavola, because alcohol levels fall somewhere around nine to eleven percent, short of the minimum twelve-percent requirement for Vin Santo del Chianti Classico DOC. Fortunately, owner Luca Martini di Cigala prefers this style of sweet wine, although exactly why his Vin San Giusto turns out this way remains somewhat of an anomaly to him. When it comes to Vin Santo producers, Martini di Cigala stands firmly in the hands-off category. The peculiar thing is that he doesn’t do anything particularly unusual in making this wine. He dries the grapes – about ninety percent Malvasia, the rest Trebbiano with a touch of Sangiovese – using every-which method, some clusters hanging, others lying on bamboo or plastic mats. After crush, typically right before Christmas, the wine is moved to primarily hundred year-old chestnut Marsala caratelli, although Martini di Cigala has begun replacing them with new barrels made of oak, acacia, cherry and mulberry. The wine rests inside the wax-sealed barrels for six years, but time and again never reaches traditional alcohol levels, leaving around 360-450 grams of residual sugar per liter. Possible guesses may include the ambient conditions of the vinsantaia or maybe a particularly slow fermenting strain of yeasts in the madre. But, your answer is as good as mine. While Vin Santo encompasses a broad stylistic range, I must admit the Vin San Giusto does taste utterly idiosyncratic. The current release, 2008, is lip-smackingly sweet and sticky, but never cloyingly so. The wine is delicately lifted by a web of floral aromas and rounded out by notes of fresh honey, candied pecans and toffee. There’s nothing remotely astringent going on here, thanks to the low alcohol. The 2007 already dips a shade more savory, a bit more waxen and evoking a hint of good mushroom funk. It tastes like a garland of orange blossoms, wrapped around an assortment of wild herbs. The 2006 manifests a different character entirely, more confectionery-like. It reminds me of walking into a warm pastry shop in the morning hours, with the bakers ready to pull the first items out of the oven. The wine tastes of shortbread cookies, dulce de leche and that same fresh leesy, brioche flavor I love in a young Champagne. The 2000 falls more in line with the 2007 in its subtle herbaceousness. This time, a Riesling-like note coats the gooey maple and melted caramel core. The 1993, born before the official DOC, actually bears the name “Vin Santo.” After more than two decades, the wine has shed much of its body but has accumulated more freshness and finesse. The wine seems like it has gained energy, the acidity showing more vibrant now that its gut is gone. It’s an enticingly perfumed Vin Santo, drawing you closer with flavors of spearmint, wintergreen, sweet basil, lavender and orange blossom. With the 1988, I begin to detect more obvious signs of age – oxidative notes of salted cashews, charred corn, burnt sugar and coffee grounds. The wine hangs in a gripping balance between these overdone flavors and a persistently fresh line of acidity. Martini di Cigala admits there have been basically no oenological changes from 1988 to the present. Volpaia shared with me the only barrel samples I tasted on this visit. It was an exciting opportunity – there are a number of wineries who never break the seal of their caratelli, so not even the winemaker gets the chance to check up on the Vin Santo mid-fermentation. We tasted two barrel samples from the 2011 vintage that afternoon, one of their Trebbiano and Malvasia blend, and the other of Sangiovese. The Sangiovese grapes were harvested after already becoming partially desiccated on the vine. They’ve yet to include the red grape in any of their past releases, but they’re considering it for the first time in 2011. Tasting these two lots separately verified how essential the Trebbiano is to a good Vin Santo. The Sangiovese seduces with curvaceous notes of butterscotch and café au lait. But, on its own, it feels a little unfocused, lacking any real destination on the palate. The white blend from barrel is just the opposite – lightweight and sprightly, driven by a vein of fresh lemon and silvered with lush yellow apple and peach flavors. I’ll be curious to see how their 2011 Vin Santo tastes in bottle, should Volpaia choose to add Sangiovese to the mix. The current release, the 2010, is not a far cry from the barrel sample I tasted of the white grapes. A blend of approximately three-fifths Trebbiano and the rest Malvasia, Volpaia’s Vin Santos age four to five years in primarily used French oak caratelli after crushing the grapes in late January or early February following harvest. Despite the not insignificant time in barrel, the 2010 is rather light on its feet. A beam of Meyer lemon acidity strikes through more confectionery flavors of whipped honey and crème caramel. Pristine and buoyant, the wine made an excellent accompaniment to the Gorgonzola proprietor Giovanna Stianti served alongside it.